Voice actors at the 4th annual live Halloween radio broadcast of “Tales of Mystery & Imagination” included from left to right Aidan Pasha as Prince Prospero, Eric Gordon as the Lord Chamberlain, Bob Daisey as the Announcer and Erica Bickford as the Lady Angelina. Gabriel Clarke and Zackary Hewins (background) provided the sound effects as part of the “Masque of the Red Death” portion of the broadcast. Microphones from Neumann and Shure, as well as Yamaha and Avid consoles, helped bring the drama to life. In the spirit of Orson Welles’ 1938 Halloween “War of the Worlds” broadcast, Husson University performed a live radio drama on the stage of the Gracie Theatre on October 30th. The Maine Association of Broadcasters, (MAB) has recognized the annual live Halloween radio broadcast for the past three consecutive years. Entered into MAB’s annual awards competition, “Tales of Mystery and Imagination” first distinguished itself in 2010 by winning an honorable mention in the “Locally Produced Program” category. In 2011, the radio program received first place in the same category. Last year, the program won second place. In addition, the 2011 edition of the broadcast won a first place award from the Broadcast Education Association. 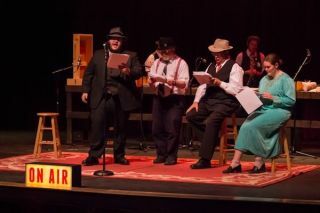 In reflecting on the success of the live radio show, Stack remarked, “The quality and consistency of “Tales of Mystery and Imagination” is a tribute to both the students and staff at the New England School of Communication at Husson University." This first of last week's stories was Edgar Alan Poe’s “The Masque of the Red Death.” It tells the tale of a ruler, Prince Prospero, who welds the doors of his castle shut to seal out his subjects who are dying from a terrible disease. And while no one can get in, it also means, no one can leave. Within his walls, he and his guests celebrate their good fortune until suddenly; an unexpected visitor makes an appearance. In the “Pit and the Pendulum,” the audience heard the story of a man sentenced to death by a panel of black-robed, pale-faced judges during the infamous Spanish Inquisition. Experience the radio performance here. Completed in October of 2009, the 500-seat theater, The Gracie, is Husson University's center for the fine and performing arts. In addition, The Gracie also serves as a learning platform for students from the New England School of Communications in digital audio, sound mixing, set design and construction, lighting, acting and electronics. Eric B. Gordon is the Executive Director for Marketing and Communications at Husson University.